a. The move to bring in 20mph limits came initially from Councillor Lisa Court. She had been concerned about the risks of large trucks carrying scrap metal trundling through the Cadwell Lane area. 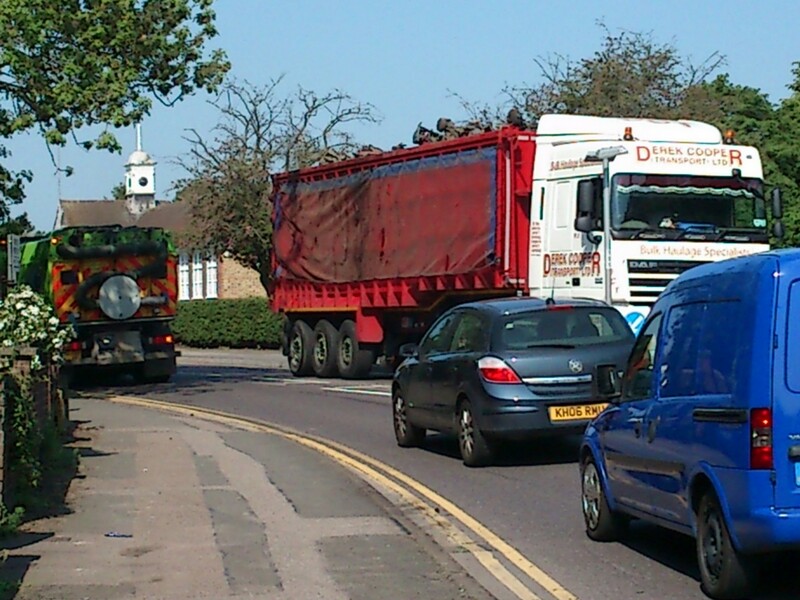 There are 400 deliveries of scrap per day in Hitchin, 400 journeys in and 400 journeys out – 800 journeys per day. The trucks do not all stick to 30mph speed limits and have been observed doing 40mph through residential areas. Councillor Court had started the 20’s Plenty in Hitchin website, drawing from the national 20’s Plenty campaign . 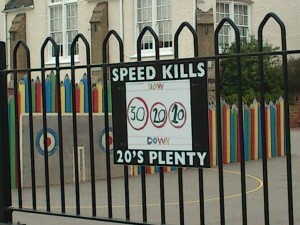 b. Councillor David Billing has proposed 20mph speed limits in certain streets in his ward of Bearton. This was being considered by the Hitchin Committee at the meeting on May 31st, with preliminary costings being provided and a feasibility study suggested. This needed referral to the Herts Highways Liaison Meeting for decisions to be made. c. A cyclist (Hitchin Forum’s chairman speaking as an individual) presented his own observations on the safety of cycling on Fishponds Road at the Hitchin Committee on May 31st. This followed a close encounter of a frightening kind with a metal scrap truck trying to squeeze in between the cyclist and a traffic island. This was in the vicinity of 2 schools and at a popular street-crossing point for pedestrians. He suggested that a 20mph limit for all of Hitchin be considered. d. The Hitchin Committee resolved to hear more about 20’s Plenty as an approach to reduce risks on the roads and invited Kevin Ambrose of the Watford 20’s Plenty campaign to speak to its meeting on September 11th. That presentation is available here – item 42. His presentation described the experience of persuading Watford Borough Council to adopt this for Watford, and discussed the next stage – persuading Herts CC to support this scheme, which is desired by Watford residents. The discussion revolved around the outdated information that the County Council has used to oppose such schemes, and Hitchin councillors’ frustrations in trying to have their agreed policies implemented. The committee said it would propose that the issue should be examined in more detail at the district’s scrutiny committee, possibly jointly with the County Council’s scrutiny committee, with all evidence being considered. It was noted that Councillor Shakespeare-Smith chaired both the Hitchin and the NHDC scrutiny committees. The statistics for reduction of casualties when traffic is slower – 95% of pedestrians survive if hit by a car at 20mph, 55% at 30mph, and 15% at 40mph – and the consequent health costs have persuaded Liverpool Primary Care Trust to financially support the campaign in that city. It has been argued that slower speeds reduce frequency of collisions and car damage as well as human casualties. The perception of safety is greater for those at the extremes of age – the very young and the very old. It is hoped that safer streets leads to less car journeys to school, less traffic and less congestion. Walking along and cycling increases on streets with lower speed limits. Extra exercise is another health benefit. 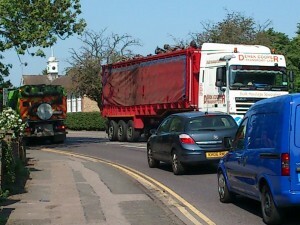 Hitchin has a particular problem with heavy trucks going through congested residential areas – Cadwell Lane, Grove Road, Nightingale Road, Fishponds Road, Verulam Road. The possibility of these being rerouted by a link to the Stotfold Road is still being talked about, but there is no sign of this happening in the next few years. The introduction of 20mph restrictions on a street by street basis has been the approach in the past. However this is expensive to implement and leaves other roads more likely to suffer the fast cars. It also seems arbitrary to identify certain streets as worthy of this restriction while others remain uncontrolled. 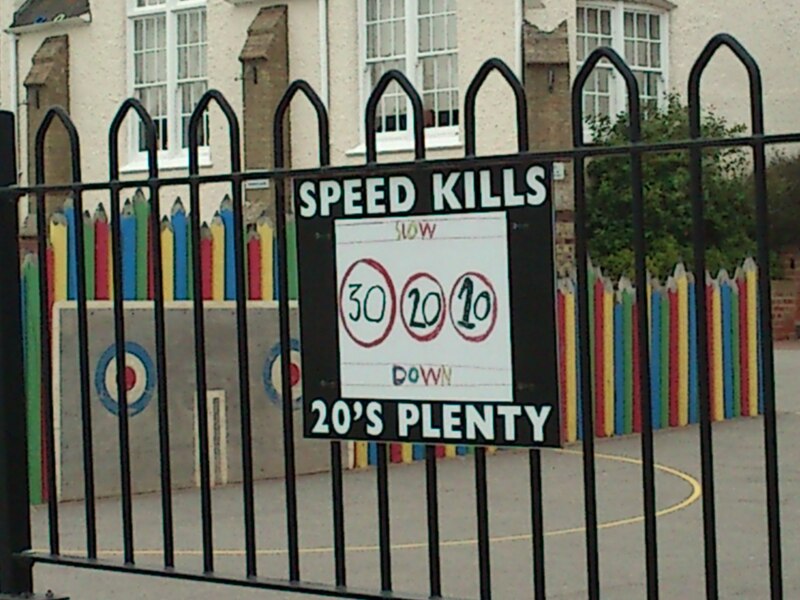 Why have a 20mph limit on Florence Street but not on Nightingale Road? Why Bunyan Road but excluding the portion after it is joined by Fishponds Road? It appears that the main routes have been regarded as not suitable for restrictions, but there is no legal reason to exclude them, and that is where fast large trucks are potentially more lethal. Lancashire County Council’s 20mph campaign also lists many of the advantages of such limits – see website. It has been asked whether such limits could be timed to coincide with school entry and exit times. However this is both expensive and confusing to drivers, and ignores the use of the streets of children, the elderly and cyclists at all times of the day. 3. What happened after town-wide limits were introduced? 20’s Plenty notes that over 8 million people now live in towns where a 20mph limit covers their residential area. This includes Portsmouth, Hull, Liverpool, York. A detailed interim study was done in Portsmouth in 2010 . Other reports come from Newcastle, Burnley and Bristol. The Burnley experience persuaded Lancashire County Council to roll out the same for the whole county. Hitchin Councillors seem committed to pursue a town wide 20mph speed limit. This has not been drawn out in detail – where the zone starts and ends, if there should be any exclusions, what signage or other measures should be used. No doubt the police will be concerned about how they will be expected to enforce this. In towns which have gone for an area-wide 20 mph limit (e.g. London Borough of Islington, Portsmouth), this usually covers all “residential” roads but excludes main through routes. Department for Transport guidelines however do not exclude this type of road. The latest (July 2012) draft guidelines say: The standard speed limit in urban areas is 30 mph, which represents a balance between mobility and safety factors. However, for residential streets and other town and city streets with high pedestrian and cyclist movement, local traffic authorities should consider the use of 20 mph schemes. This guidance means that the A505 between Fishponds Road and the station would probably qualify for a 20mph limit. From the experience elsewhere it seems of clear benefit to the town to have such a policy and that the Forum should support it. It should make Hitchin a safer and more pleasant place. No other policy is likely to bring about such changes in the foreseeable future. It seems likely that the Hitchin councillors will not find the implementation easy. At the September Hitchin Committee their frustration with the system of implementation (ie. lack of support from county highway officials) was clearly expressed. It also seems likely that they would benefit from community support for this. Eventually democracy and a clear message of what the community wants should bring about change.